Lena Henningsen. 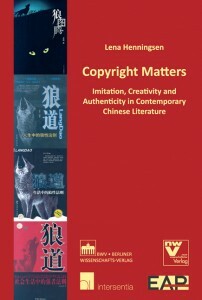 Copyright Matters: Imitation, Creativity and Authenticity in Contemporary Chinese Literature. Intersentia / Berliner Wissenschafts-Verlag, 2010. 279 pp. ISBN: 978-94-0000-044-5 (paper). Lena Henningsen’s study of copyright and plagiarism provides a window into contemporary Chinese popular culture, informing her readers of the most current trends in commercial Chinese literature. This book combines literary analysis with sociological, legal, and economic data on the often decried problem of piracy in China, generating fresh readings of contemporary Chinese literary culture in the twenty-first century. Indeed, Henningsen’s exploration into intellectual property, piracy, and creativity leads to a reassessment of what it means to compose literature. The book is comprised of a prologue, introduction, five case studies, and conclusion. The author describes her methodology and the implications of her book mostly in the prologue, introduction, and conclusion. Three of the case studies are concerned with Chinese novelists publishing in the twenty-first century, one examines the Harry Potter phenomenon in China, and the final study discusses academic plagiarism in China. I will enter into a detailed discussion of the individual chapters below. The study engages two seemingly contradictory themes, both of which center on issues of imitation and creativity in the contemporary Chinese publishing industry. Henningsen’s first theme puts forth the argument that imitation and even some plagiarism can be productive tools for creative endeavors, leading to new versions of a popular text or new readings of contested symbols in the cultural landscape. In chapters one, three, and four, Henningsen discusses various ways in which imitation and/or plagiarism have indeed contributed to and helped produce creative works of art in contemporary Chinese literature. The second theme the book delves into is the increased attention to the importance of copyright in China. Chapters two and five marshal the pronouncements of published authors and academics to support the argument that, although China has a reputation for being a culture that flouts intellectual property rights, many leaders of the cultural field are in fact arguing for increased attention to the importance of copyright. Henningsen combines literary analysis, legal scholarship, and an extensive survey of the field of contemporary Chinese popular literature to analyze these two ostensibly opposed tendencies. The Introduction, “Copyright in China and ‘the West’: Textual Appropriation or Intertextuality?” is an examination of creativity and the concept of the original work of art in Western and Chinese history. Henningsen here discusses the concepts of intertexutality, imitation, and authenticity, setting the stage for her analysis of Chinese popular fiction by arguing that while the western media often portray China as a “nation of plagiarists, copying and selling everything available to them” (13), in fact production of cultural objects in China, plagiarized texts included, is much more complex than it seems. By presenting historical data and analysis of the composition of art in premodern Chinese and Western culture, she questions the idea that creativity should be defined as a single individual creating a completely novel product, either in the West or in China. Her historical overview of the concepts of creativity and authenticity lays the foundation for her readings of Chinese novels; she argues that the traditional concept of literary imitation is one that provides much leeway for authors, either by condoning the culling of existing material for them to use in their own stories, or in giving them something to react against in their work. After providing historical context of imitation in Chinese aesthetics in the introduction, in her first case study Henningsen shows how one contemporary author engages traditional ideas in his artistic practice as a means of defending himself against charges of plagiarism. In chapter one, “What is a Plagiarist? Guo Jingming–Convicted Plagiarist,” she presents the somewhat scandalous case involving the famous young author Guo Jingming. He gained national fame in 2003 with his first bestselling novel, a fantasy titled Magic City. His next novel, Never-Flowers in Never-Dream, was about a love triangle involving young people in Beijing, and had so many similarities to Zhuang Yu’s novel Inner and Outer that she successfully sued him for plagiarism, being awarded 200,000 RMB (approximately $24,200 at the time of the verdict in 2003), which she got, and a public apology, which Guo managed to withhold. Since the novel was not a word-for-word theft, Henningsen performs a close comparative reading of the two novels, revealing structural, plot, and stylistic similarities strongly indicating that Guo Jingming must have lifted his story from Zhuang Yu’s novel. Because both novels center on the exploits of young women in contemporary Beijing, Henningsen reads them as examples of the genre of what she calls “babe fiction,” which other critics have translated less literally as the work of “beauty writers.” Henningsen’s discussion of the genre is informed by primary texts such as Shanghai Baby and Candy, but does not engage with other secondary scholarship in the genre. In this discussion Henningsen conjectures that, in his quest to write another bestseller, Guo Jingming “may have been looking for inspiration among extant texts” (71). After the conclusion of the court case, Guo Jingming published his third novel, Rush to the Dead Summer, which Henningsen interprets as both an autobiographical defense against plagiarism and an artistic theory that uses the traditional Chinese concept of linmo (imitation), which she defines as, “a technique by which an artist copies masterpieces in order to study and learn the technique applied in the respective pieces” (35). Rush to the Dead Summer is about a painter who was wrongfully accused of plagiarism after he gave an interview in which he told a journalist he experimented with another artist’s style. His remarks are then modified before being published, leading people to believe it was an admission of plagiarism. Henningsen then draws a connection between artists using linmo-type experimentation with other artists’ styles as a method of refining their own work, and Guo Jingming’s copying of Zhuang Yu’s style in order to better grasp a literary genre with which he was not previously familiar. In this reading, Guo Jingming’s obvious plagiarism is incorporated into an artistic theory of copying examples in order to refine one’s own style. His creative changes to Zhuang Yu’s novel, Henningsen avers, are seen as proof of the possibility for innovation in imitation. Alongside Guo Jingming, Han Han is one of the two most successful young authors of the “post ’80s” generation, so it is fitting that in her second chapter, “To Steal a Book Might Not Be an Elegant Offense: Han Han–Victim of Plagiarism,” Henningsen discusses Han Han’s pronouncements against plagiarism and piracy as a counterexample to Guo. Much of Han Han’s writing is autobiographical and is published with multiple prefaces that he composes. Henningsen argues that this is one way of blurring the lines between fact and fiction: readers are led to believe that the fictional character is Han Han himself, this position gaining authenticity via the prefaces. While, in the previous discussion, Henningsen read Guo Jingming’s Rush to the Dead Summer as a manifestation of his linmo theory of creativity through imitation, she here argues that Han Han’s insistence on authenticity and originality in his work is a function of his self-identification as an author. She reads a passage from his novel Speeding Along Like Early Youth, about the daily lives of two plagiarists, alongside one of his prefaces enjoining people not to use his name on works he did not compose, denouncing plagiarism and piracy. His story points out the futility of the endeavors of people who write false stories under famous names. Henningsen’s careful analyses of the works of these two bestselling young authors help bring to light many important elements in our understanding of the Chinese publishing industry, literary-cultural scene, and the very future of Chinese literature, as both authors promise to remain important figures in Chinese culture–Han Han with his blog and magazine, and Guo Jingming with his efforts to support the careers of other young authors. Henningsen’s third case study centers on the work of an older intellectual, and the only work in her study that has been published in English translation. Jiang Rong’s 2004 novel Wolf’s Totem (Henningsen uses this title rather than that of the published translation, Wolf Totem) became a phenomenon in the Chinese publishing industry and in PRC literary culture; anybody who went into a bookstore in China in the mid-2000s can attest to the inumerable books with wolves on the cover–Henningsen reproduces four of them on her own cover. This chapter helps the reader to understand the significance of the wolf trend in China. Rather than seeing the novel as creating the phenomenon, Henningsen reads Wolf’s Totem alongside other wolf stories published in the twenty-first century, notablyRemembering Wolves (2000) by Jia Pingwa, and argues that Jiang Rong was tapping into a cultural trend already in progress. She goes on to read novels that seem to be imitations of Wolf’s Totem, deciphering the symbol of the wolf and its ability to be used in many different forms–from military adventures to self help guides–concluding that the symbol of the wolf is multifarious –“contestable and debatable” (136)–and thus can be deployed to serve a wide variety of creative agenda. The employment of wolf imagery for so many different purposes leads Henningsen to argue that what first seems to be simple imitation is in fact “a highly efficient catalyst for creativity” (136). She concludes that such cases of “imitative creativity” are essential for the progress of culture, a position that perhaps could have been further developed throughout her text. Her next chapter, “The Politics of Fakery: Harry Potter between Fake and Fan Fiction,” moves to the imitation of foreign works, as she analyzes piracy and copyright infringement of the Harry Potter novels through the lens of fan fiction, which “refers to fictional texts written by the fans of a popular series” (162). This chapter discusses Harry Potter fan fiction in China and globally, arguing that these imitations are a form of apprenticeship for young authors; just as people praise the Harry Potter series for encouraging young people to read, the Harry Potter books, in Henningsen’s appraisal, also encourage them to write. Henningsen refers to a number of different Chinese Harry Potter novels, differentiating between fake and fan fiction and identifying interesting references to Chinese culture that appear in the original Harry Potter franchise: Harry uses a magic wok, is a tourist in China, works with Chinese foreign students, etc. This theme was developed more fully in an earlier article. The differentiation between fake and fan fiction is important in the study primarily as it relates to international copyright law. Whereas fakes may be in violation of copyright, texts labeled “fan fiction” are more protected. Henningsen, who uses fake as a “non-normative term, relating to the creative recycling of existing material” (162), is able to see value in both kinds of texts. In most cases of creative imitation, Henningsen asserts, authors are not simply lifting the plot, themes, and characters from the famous franchise; they are creatively adapting the novel and–in the case of Harry Potter fan fiction–adding elements [of Chinese culture] to enrich the story. Henningsen consequently argues for a new understanding of fan fiction and creativity, pointing out that it is quite difficult to produce a text that is similar enough to the original to attract its readers, yet different enough to avoid allegations of plagiarism. Henningsen’s final chapter on plagiarism in academic writing addresses a topic that extends well beyond bestselling fiction. This chapter, titled, “The Work of Academic Writing in the Age of Digital Reproduction: Discussions of Academic Plagiarism on the Chinese Internet,” is included in the study to show that copyright and original work are increasingly valued in Chinese society. The chapter pairs with chapter two, which focuses on Han Han’s attention to piracy, to argue that there is a rising level of consciousness of intellectual property and copyright in China. She notes that many of the people involved in the debate on academic plagiarism remark that trends in academia can be seen as the “cultural standards of society” (199). Therefore, the increased consciousness of plagiarism in academia comes at a time in which the issue is recognized as having significance to the whole culture. Through an analysis of some of the internet debates surrounding these cases of academic plagiarism, she notes that more and more people are calling for academic standards and the elimination of corruption in academia. These authors even develop a “theory of plagiarism” and work out sophisticated methods of proving plagiarism in academic work. Henningsen further notes that some academics who make strong public condemnations of plagiarism may have the ulterior motive of attracting readers to their websites. The interesting ideas that Henningsen raises on literature, creativity, and the meaning of the author deserve to be fleshed out, and she has provided readers with much fruit for analysis. One possible criticism of the book is that at times Henningsen uses multiple examples and complicated charts to make her arguments about plagiarism, but the conclusions she draws from these details are not always fully elucidated. A final complaint is that the book was poorly copyedited, and at times the spelling and usage errors become distracting. These criticisms aside, readers of Copyright Matters will learn much about the publishing industry and especially about popular fiction in contemporary China. The chapters contain abundant useful information on bestselling novels from the twenty-first century and give lively discussions of their themes and contents. Her employment of plagiarism and creativity as a lens through which to interpret bestselling novels is a unique, timely, and appropriate way to examine contemporary Chinese culture.